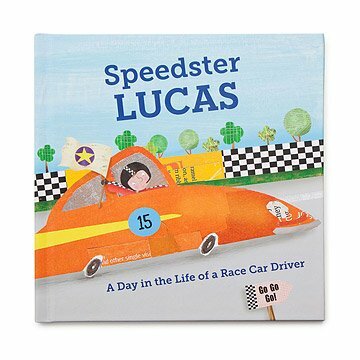 Cast your child as the race car-driving hero in this vibrant personalized book. And they're off! Whether your little boy is driving the grocery cart to vegetable aisle victory or riding the couch cushions down the racetrack stairs, give him a win to remember with this high-speed personalized book. Kids will delight in being cast as the speedster hero, racing past their two best friends - and even a wayward llama! - to first place fame. An award certificate finishes the story, complete with a personal message from you. Hand bound in the USA. At this time the Personalized Speedster book is only available with male characters. Anytime story telling - morning, noon, or night. Can't Wait to Gift It! I love the way my grandson's information (friends, birth date etc) have been woven into the story. We would buy this again & again as gift for other children!! This personalized children's book will draw young minds into a very well written & well illustrated storyline of success. And if failure occurs, the steadfast love of friends & family remain is the story's final message. My Grandson is on the spectrum could read this book back to me. Hands down this book thrilled me to bits!! The personalization again was spot on and fit into the story very well. The fact that you can add 2 real friends names was AWESOME! Recipient won't receive book until Christmas, but I read it twice before wrapping it. It will be keepsake that I feel will be forever enjoyed by family members for generations to come. This's book will be a "MUST HAVE" for any new babies that are born between now and whenever I leave this earth.